Home » About us » Why Broderick’s? Choose Broderick’s for your vending and refreshments needs, and you can rest assured you’re in safe hands. Why? Because we put your business first. You’ll see our customer-centric approach in action. From the day we work with you to plan the perfect, bespoke solution for your venue and consumers – and throughout our working life together. What do we mean by being flexible? Well, imagine your business’ needs change part way through your term with us. Other vending companies will keep you tied to the same arrangement. But at Broderick’s, we’re dedicated to continuing to meet your changing requirements – not to locking you into a contract. So, if you’d like to upscale – or downscale – your vending machines, we’re always happy to talk. We may not always be the cheapest, but our Broderick’s bond promises we’ll always, always bring the very best value for money. They say you get what you pay for – and to an extent that’s true. But what Broderick’s offers over and above the rest is; the quality, service and on-the-ball approach. That will see you continually reaping ROI from your vending machines or bespoke Broderick’s refreshments solution. Choose your payment plan with us too – our flexibility extends to how you finance your machines. 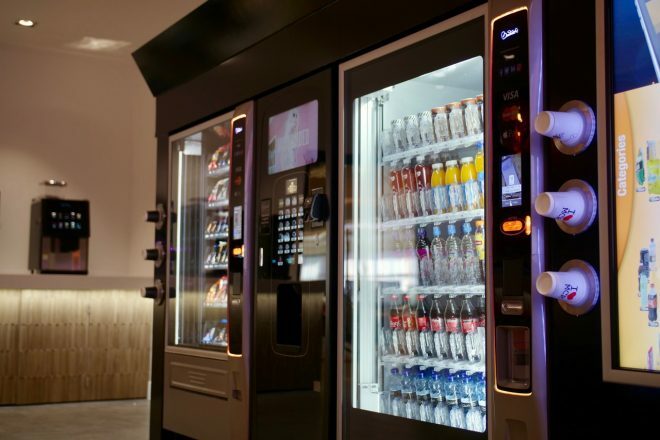 The only vending company to update technology mid-term, the Broderick’s team is passionate about leveraging all the business-boosting benefits the newest technology can bring your organisation. Investing in innovation and trialling new technology means that our solutions for your business are always evolving. That means more growth opportunities for you. With nationwide capability, a fleet of installation and maintenance vehicles and a highly trained team, Broderick’s is backed by reliable infrastructure that means we’re there for you when you need it. Even if that’s 3am, or Christmas Eve! Showing year on year growth for the last three consecutive years, we’re investing in the future and our long-term relationship with our valued customers. Our environmental footprint is something we take very seriously. Broderick’s has held the ISO 14001 environmental accreditation for 20 years. We are continually looking for ways to review our waste honourably, and are known in the industry as early adopters of new-in technology to reduce plastics. We’ve spent the last year researching the most environmentally friendly option for fully recyclable paper cups, and we’re pioneering cup lids made from fully biodegradable bagasse, a by-product of sugar beet. Our MD John Broderick sits on the AVA (Automatic Vending Association) Cup Committee – which is partnered with the Paper Cup Recovery and Recycling Group, to lead the agenda on cup recycling. Our innovative PET recycling scheme – where we will pick up bottles for recycling and the money for returned bottle will be reimbursed on the Broderick’s app – is set to work across our full estate of vending machines as well as cafes: a huge leap forward in reducing plastic waste.